EXECUTIVE SUMMARY: All Palestinian entities and organizations – from the PLO and PA through the factions, Hamas, Islamic Jihad, and the Salafi groups – have long sought to kill or maim Israeli Jews and damage or destroy their property. The March of Return in Gaza, the latest Palestinian innovation, is similarly intended to lead to bloodshed. Hopefully, Israel will be able to quash the event to save both Israeli and Palestinian lives. Ever since Fatah waged its first act of sabotage against a pipeline of the National Water Carrier on January 1, 1965, the newly emergent Palestinian national movement has waged a consistent war against Israel. 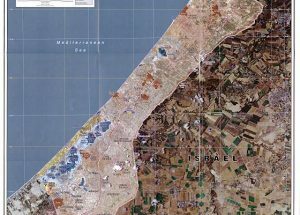 At the most basic level, Palestinians and others have been consistently urged for decades – by all Palestinian entities and organizations, from the PLO and PA through the factions, Hamas, Islamic Jihad, and the Salafi organizations – to kill or maim Israeli Jews and damage or destroy their property. These various organizations only disagree over the tactics to achieve these objectives. Mahmoud Abbas, the president of the Palestinian Authority (or Palestinian State, as it appears in its logos and correspondence) is constrained by the necessity to achieve these objectives through “popular struggle” – in other words, through sticks, stones, and incendiary bombs, but excluding firearms, suicide bombings, and missiles. The other organizations have no such restraint, including Fatah, the organization Abbas heads in addition to the PLO and the PA. Their only limitations are their capabilities. In the West Bank, these are very low thanks to Israeli Security Agency intelligence, preventive arrests, and security cooperation with the PA, which shares an interest in destroying Hamas, a common enemy. As experts in the production of violence, these Palestinian entities and organizations know that the “routine” production of violence through “armed” and “popular” struggle is insufficient – not only for the achievement of meaningful political objectives such as Israeli withdrawal, but also for holding the international media limelight in the battle to delegitimize the Jewish State. To put it bluntly, the killings of two fathers of large families and the severe maiming of two Israelis – the crop of Palestinian violence in January and February 2018 – did not make headlines beyond the Israeli and Palestinian media. This level of impact cannot change the balance of power between the two sides. As painful as these attacks were, few Israelis, whether on the right, the center, or the left, will be swayed by them to change their opinions on the Palestinian issue or on those in power. For their part, the Palestinians are painfully aware that ever since the so-called Arab Spring, its bloody aftermath, and the multiplication of Iranian-Saudi and Shiite-Sunni proxy wars, the threshold of killings and maiming they must achieve to take and maintain the limelight has become appreciably higher. Palestinian organizations compete with the Russians and Syrians in their indiscriminate air bombings of Ghouta, the area that covers the eastern suburbs of Damascus, as well as, to a decreasing extent, the violence in Iraq, Yemen, and Libya. This is why tens if not hundreds of members of these organizations consistently try to come up with new ways to start waves of violence that, if frequent enough, will undermine the Israeli will to maintain a democratic state in a region of states on the brink of war, such as Lebanon, or deep in the throes of war, such as Syria. The latest innovation is the idea of a massive procession of 100,000 Gazans with the objective of storming the Israel security fence around Gaza to signify the return of Gaza’s refugees to their original homes. Needless to say, the protestors will hardly be the original refugees, who would have to be at least 69 years old – the time that has elapsed since the establishment of Israel in 1948. The immediate objective of the prospective fence-stormers is not so much to kill Israelis (though if that can be achieved, even better), but to get killed themselves. Their hope is that Israel will resort to force to maintain the border (as would any sovereign state) and thereby create the graphics and funerals that delegitimize Israel. The long-term objective of the event is, in fact, to kill and maim Israelis and damage their property. Hamas and other factions are hoping this will lead to mass waves of violent protest and self-initiated suicide terrorist acts in the West Bank and among Israel’s Arab citizens. Ideally, from the perspective of the Palestinian organizations, it will yield a full-scale intifada. Even in the best of times, one cannot predict what will happen. The questions of why and how to rebel are studied closely by status quo powers, by rebels and terrorists, and of course by many academics. After a hundred years of study, the triggers of sustained mass waves of violence remain largely a mystery. They do not fit into the neat formulas that characterize the exact sciences. Israel wants to maintain the status quo in which people go about their lives peacefully. The Palestinian terrorist organizations want to change the status quo. Gaza, after eleven years of Hamas rule, is meant to become another Ghouta, another bloody Baghdad, or even another full-fledged failed Palestinian state. This project is fraught with difficulty because the Palestinians are divided, even more so after the attempted assassination of Palestinian Prime Minister Rami Hamdallah in Gaza. So divided are they that the major actors – the PA and Fatah on the one hand and Hamas and Islamic Jihad on the other – can’t even agree on the date on which the fence-storming should take place. Fatah supporters want it to be held on May 14, the date in 1948 on which Ben-Gurion declared the state of Israel and five Arab states invaded it. The Palestinians have appropriated that date for commemoration of the Nakba – the failure of the Palestinians to destroy the state of Israel – and the plight of the refugees, though the exit of Palestinian refugees had little to do with that particular date. Hamas wants to stage the event on March 30, on which many Israeli Arabs commemorate Land Day. There is a good chance that marches will take place on both dates, and Israel and the Palestinians are preparing assiduously. The Israeli army will do everything it can to thwart the protestors in ways that avoid bloodshed. The Palestinian organizations, from the PLO and the PA downward, want blood to be shed. Hopefully, Israeli intentions will prevail. This is an edited version of an article that appeared in The Jerusalem Post on March 26, 2018.